In celebration of 15 years as partner in rehabilitation, Therapy Center plans to host several giving back events in the communities we serve. Our current project is a toy drive for St. Jude Children’s Research Hospital. 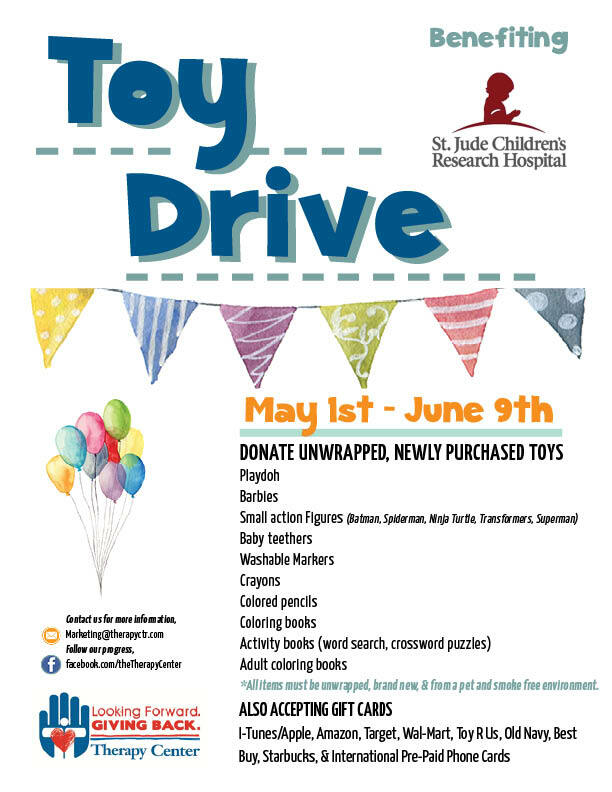 The toy drive started on May 1st and will end on June 9th. All donations will be delivered to St. Jude Children’s Research Hospital in Memphis this summer. Therapy Center is collecting items to donate to children receiving treatment at St. Jude Children’s Research Hospital. The team at St. Jude’s has spent more than half a century finding cures and saving children, and their groundbreaking research has helped push the survival rate for childhood cancer from less than 20% in 1962 to more than 80% today. Therapy Center is excited to share in the effort of bringing a smile to a child that has been faced with a challenging circumstance. Their life is much different than a typical child, and often we forget that in the midst of the blood draws and radiation, the little things such as a coloring book or Barbie doll may allow them to have time to feel like a normal child. See the image for items being collected.